South Coast Soul is heading back to Bali! Spend 7 nights and 8 day's reconnecting to Self. Enjoy delicious, nutritious food, Balinese culture, Daily yoga, Meditation, Yoga Nidra and Silent Journalling, as well as workshops and experiences that support and nourish your spiritual and emotional growth. More a state of mind than a place, Canggu is a resort village on the south coast of Bali, Indonesia. A villa-filled stretch of land between Kerobokan and Echo Beach. It's surrounded by terraced rice paddies and known for its laid-back environment, boutique cafes and restaurants. The nearby Seminyak resort area has a balance of high-end shopping and weekend markets. Far enough away from the hustle and bustle of Kuta and only an hours drive to the stunning temples and forests of Ubud. The Canggu village vibe is alive and heartwarming and Balinese people are so friendly and content in everyday life it is inspiring. Our private villa is located in the rice fields of Canggu with a panoramic view of it's natural surrounds from the pool, upstairs bedrooms and our rooftop Yoga space. There is an Outdoor kitchen for our private chef to prepare our meals and friendly cleaning staff to tend to your room daily. > A day trip to Ubud to experience the sanctity of Tirta Empul Water Temple followed by a private Cycling tour through lush rice paddies, time to explore the beautiful Ubud markets. Restaurant lunch and dinner on the day trip is also included in the retreat price. ** Flights are not included and can be purchased for between $500 - $800 return. There are 11 spaces available! Places are secured upon your payment of the 30% Deposit. Last years Retreat to Canggu was amazing and we would LOVE to have you joining us in our second year of practicing abroad! This 2 hr workshop is for you! - Falling back to sleep after after waking. - Use of pre and post dream states for self reflection and improvement. - Dream diaries as a method of self exploration. With South Coast Soul studio owner Natalie Childs. Can you imagine leading a life where you knew how to choose love over fear in every waking moment? In this 2 hour Workshop Natalie will teach you simple and effective ways to live more consciously with an open heart. Releasing limitations, to experience a deeper state of being. In the same way that light can remove darkness, love can remove fear. Unshackle yourself from the very thing that has prevented you from living your best life. It is never too late to step into your innate power. Start your Yoga Journey with South Coast Soul! We’re offering a 4 week term for beginners. Available and suitable for everybody. These classes will help you ease with confidence into a consistent and well rounded Yoga practice. Our Moon style practice is grounded and slower paced with the intention to calm and stabilize the mind while lengthening the back of the body (hamstrings, back, neck and calves) while providing an internal massage to the nervous system and abdominal organs through gentle compression of the abdominal organs. Katie brings a wealth of knowledge to South Coast Soul with many years of practice and teaching experience. She is a passionate advocate for collaboration and community believing that we thrive as a collective in a nurturing, open environment. Her first teacher, Hamish Hendry (Ashtanga Yoga London) laid this foundation, consistently showing her warmth, kindness, compassion and patience. Katie has since sought to grow these qualities in herself, and will share this life affirming tradition with you in an authentic, nurturing and accessible way. She has been blessed to have studied with some of the world's most dedicated teachers including Sarah Powers, Annie Carpenter, Simon Borg-Olivier and Mark Robberds. Each have inspired and shaped her in a deeply soulful way. Recently, Katie studied with our beloved local 'Teacher of Teachers' Himani Smeaton, rediscovering a back to basics approach to exploring the vastness of the Yogic landscape. Katie grew up yearning to travel and experience different cultures. She pursued studies in Business at The London College of Fashion and went on to achieve an Honors Degree at Westminster University. This led to a highly accomplished career as a Financial Copywriter for prestigious international Fund Management firms. Yoga found her in 1999, becoming an anchor for creating space and stillness in the busyness. She committed to the practice fully..
After a decade of career success, Katie took a sabbatical and traveled solo throughout South East Asia and Australia in 2005. A life changing experience. She settled on the Sunshine Coast in 2007 and her daughter was born in 2008. They moved to Jervis Bay in 2010 and she soon gained her certification in Hatha Yoga. She has gone on to study Vinyasa, Yin, Restorative, Anatomy & Physiology and Children's Yoga and feels privileged to share her practice with us here. Expect deep forward folds and twists combines with kriya practices, grounding pranayama techniques and deep meditation for you to create space between yourself and your thoughts as we receive the Yogic gift to stay stable amongst turbulence. With a diverse spectrum of knowledge, including a 200hr training in L.A with Black Dog Yoga and a 500hr training with Sri Dharma Mittra at Dharma Yoga Centre in New York City. One of Josh’s talents can be found in teaching the most unlikely practitioner how to face and conquer fears through alignment, technique and getting upside down. 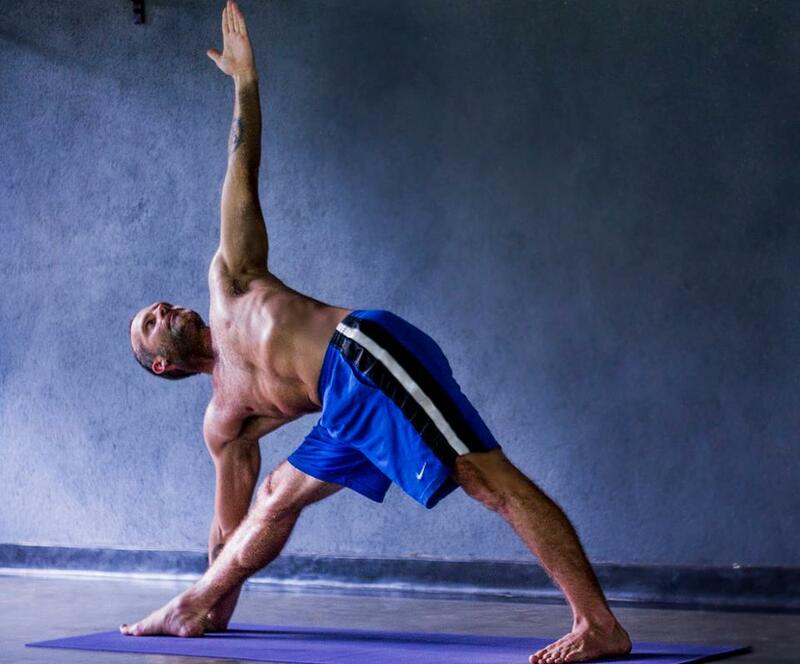 With deep respect to the origins of Yoga, Josh brings pranayama, meditation and devotion into his classes. Elemental Grooves teacher Damion has been teaching and performing West African drumming and dance for over 15yrs. Having studied and worked with teachers from Guinea, Senegal, Ghana and Gambia he has had the opportunity to learn about the rich vibrant culture and traditions of West African drumming and dance. The drumming workshop will look at traditional polyrhythms and breaks for Djembe and Dun Dun. The dance is a fun high energy workshop that has 5 stages, stretch and warm up, step orientation, arms and upper body, choreography and cool down. Book 1 workshop or both for a discounted price. Limited availability. Want to set the foundation to Master your 2019!? Monday Morning Mastery is being replaced with New Year Mastery for 1 Day only. Like a building, a relationship or a business we too need a strong foundation to thrive. New Years Eve sets the tone for the rest of the Year and we want to assist you in directing your energy wisely. Join us for NEW YEAR MASTERY. When: 6:15 am - 7:45 am Monday, December 31st. > Yoga mat or Towel. It is a place where we discover and integrate new blueprints that serve the people we are becoming. We come together as equals united by our common purpose. New Year Mastery $19.00 (Book online) or a class from your pass. South Coast Soul are offering a FREE open day to NEW students. Whether you have never practiced yoga or have just never practiced yoga with us. We welcome you to join us for a Sunday morning of complimentary information and class experience. 8:00 am - 8:30 am What is Yoga? All equipment, water, herbal tea and a head and temple massage (DoTERRA essential oils) also included and complimentary. Join our 4 passionate teachers in our friendly, safe and non judgmental environment. Spaces are strictly limited. Get in quick! Rebirth | Rejuvenate | Renew. Spring is a miraculous experience. The whole world comes alive after the winter in which it seemed that everything was dead. The world comes filled with color and the scent of delicious greenery. The world that seemed so dull and cold come's alive once again. Little did we know that beneath the cold hard ground the plants and trees were preparing for rebirth. To live out their dharma and thrive. Spring gives us hope for rejuvenation in our own lives as well. Spring is a time to renew the excitement and zest for life that lives inside each and every one of us. Bounce back from the winter chill and join us for our 30 day Yoga Immersion! Prepare yourself for fresh ideas, inspiration, and transformation. - This immersion is open to everyone. New and existing students of SCS. - Spaces are limited, don't miss out. - The T-shirt's are black. Orders will be made on the 17th of September and generally, take 3-5 business day's to arrive. - You don't have to practice in the studio every day. It is the idea to practice daily. We hold the space, it's your job to stay consistent. Join us for our SoulSteps event, a transformational journey through yoga and sound, with Kelli Prieur of HeartGlow Yoga and her fiancé, world-renowned Australian DJ Kid Kenobi! Spaces are limited and with their last event selling out in a matter of days, pre-booking for this musical yoga journey is a must!! Join Natalie for this exciting opportunity to begin your yoga journey in a safe and friendly environment. These workshops are designed to give you all the knowledge you need to take part in public yoga classes as well as to serve as a strong foundation for your home practice. Places are limited, don't miss out! Natalie Childs is the founder of South Coast Soul and is extremely passionate about guiding fresh faces into the yogic lifestyle. After just completing additional Training with Rod Stryker in beautiful Bali, Natalie is feeling inspired about sharing this tradition with her students. South Coast Soul is heading to Bali! Thank you all for showing so much interest in our 2018 Bali retreat! We are so excited to be able to take some of you to Canggu with us next year. Imagine wandering passed your private pool toward a spiral staircase at sunrise. You climb to the rooftop to find your yoga mat already rolled out for you, overlooking the stunning rice fields of Canguu. There is incense burning, ambient music playing softly in the background and you smile to yourself knowing that you have the freedom to do whatever your heart desires for the next 8 days in beautiful Bali. Following your (optional) morning yoga and meditation practice facilitated by Natalie. Enjoy a nutritious breakfast which has been made especially for you, gather your thought's in your retreat journal (provided) and then relax by the pool or explore incredible Canguu and all that this wonderful part of the world has to offer. South Coast Soul Retreat is open to everyone from advanced yogi's, intimidate students to complete yoga beginners. For just $2,100 one of our very limited spaces can be yours. Skip the Winter blues this year by escaping with us to paradise. 7 nights and 8 day's touching base with Self while enjoying delicious nutritious food, Balinese culture, daily yoga, and meditation plus experiences every day that will support and nourish both your spiritual and emotional growth. More a state of mind than a place, Canggu is a resort village on the south coast of Bali, Indonesia. A villa-filled stretch of land between Kerobokan and Echo Beach. It's surrounded by terraced rice paddies and known for its laid-back environment, boutique cafes, beach clubs, and restaurants. The nearby Seminyak resort area has a balance of high-end shopping and weekend markets. Far enough away from the hustle and bustle of Kuta and only an hours drive to the stunning temples and forests of Ubud. The Canggu village vibe is alive and heartwarming. The Yoga is the best that I have experienced and the Balinese people are so friendly and content in everyday life it is inspiring. The 8-day retreat includes daily yoga and meditation on the rooftop of our private villa, private group yoga classes and Kirtan with the amazing teachers from The Practice Bali as well as a 10 class pass for their studio located 5 minutes from our doorstep. We will take a day trip to stunning Ubud for purification rituals at the holy water temple, discover Tegenungan waterfall, and visit the Monkey forest. A sacred offering workshop and Yoga Nidra is also included. You will also enjoy an Aromatherapy facial and Ultimate Massage at Goldust Bali. The Practice Bali is a haven for deep spiritual teachings, personal development and mentoring. The facilitators at The Practice include owner Octavio Salvado, Karina Guthrie who are both highly reputable Yoga Teachers internationally. “Practice is like gravity, it not only draws us closer to our Center, it also arranges magnetically so that the exact experiences we need in order to fill our spiritual reasons for being here, our Dharma (purpose) are drawn towards us. The Practice Bali is a place to cultivate that focus and find Centre. That fearless heart inside us all that pulses to the beat of courage, humility, dedication, devotion, and playfulness. Born from the love of yoga and an understanding of the importance of community in our lives our Centre is for you. The people, the practitioners, the true lovers of yoga. Here, besides the rolling waves of Canggu and nestled amongst Bali's temple bells, incense smoke and rice field views we are dedicated to the science of yoga, to both the mathematics and poetry of this system we adore. We are one part strategy, the others, ecstatic spontaneity - The two wings of the one great bird of practice so necessary for the flight of freedom that we are all destined to take. The Practice is a temple, a place to make our offerings for the gift of embodiment." SECOND RELEASE package Price $2,200pp. SALE NOW $1,799 UNTIL SUNDAY THE 27TH OF MAY. Deposit: (inclusive of website booking fee) or $400 direct depost. Immerse yourself in 21 Day's of soul searching, belly breathing, limb stretching, mind-altering and life-changing Yoga practice with South Coast Soul. At South Coast Soul we pride ourselves on our friendly community and safe, non judgmental space where our students feel at home away from home. With students ranging from 18 to 84 years of age we provide classes for all body types and abilities. It doesn't matter if you've tried yoga once, never or one hundred times, this challenge will have you feeling better, thinking clearer and living larger. - Challenge members only class on Sunday the 1st of July 7:00 am - 9:00 am followed by complimentary lite breakfast and Chai tea. You brush your teeth twice a day for oral hygiene but what are you doing on a daily basis for your mental health? $160 or bring a Soul Mate and get both places for $300! Shift & Raise your Vibration - Empower your inner Wild and move into a state of courage, self-worth and most importantly, self-love. Shifting into a state of acceptance of what needs to be released, so that you realize and become the best and brightest version of you. Through balancing out the masculine and feminine energies within In this workshop you will explore how you limit yourself, what fears you may be holding onto and address those so that they may be cleared. We will move through meditation and breathwork, a soulful yoga flow, freeing yourself in free movement and finally end in a sound bath using the healing vibrations of crystal bowls and shamanic chanting. Clear what needs to be cleared. Forgive what needs to be forgiven. Step into being who you were meant to be; authentically you. Arrive early to energetically drop into the space. This workshop will sell out! Book online to reserve your space. Karina's passion lies in empowerment and she honors her students by creating a safe space of love and connection for them to embody the concept of what being 'wild' means to them. She is on a path of continuous healing and growth using Yoga, meditation, breath work, pranayama and sound medicine, all of which are used in her creation, Empowering the Wild. She has a Bachelor in Human Movement and Health Education, she has over 10 years experience in the health and education industry, with a background in welfare and mental health. She believes the process of letting go is not limited to the mind, and that the most effective forms of release and healing occur when the body and mind are addressed as a union. She has completed two 200hr Foundational Yoga Teacher Trainings with Absolute Yoga Academy and HYA Yoga Studios & Academy, 100hr Yin Yoga Teacher Training with Sarah Owen & Janine Leagh, Embodied Being at HYA Yoga with Janine Leagh & Embodied Flow Mind 100hr with Tara Judelle and Scott Lyons. Karina teaches Power Yoga, Hot Yoga and Dynamic Flow Yoga and Yin Yoga. This workshop is based on making your own set of blessing beads and finding your own inner strength and virtues. Part of your registration fee goes toward sponsoring the virtues project and providing training materials in India. Your fee covers all materials, morning tea, and lunch. What I’m asking is: Who are you really and have you ever asked yourself or been inquisitive enough to find out? According to research, we make 35,000 decisions per day. When our conscious mind is in thought we are controlled by our subconscious which is a program that is instilled in us from our 3rd trimester to age 7. Imagine reprogramming your mind and dissolving the limiting beliefs that stop you from using the higher faculties of yourself. Imagine every decision you make being as simple as; will this take me toward or further away from achieving my life's purpose. Join the South Coast Soul Tribe in uncovering 'Your Best Self' and make 2018 your best year yet!